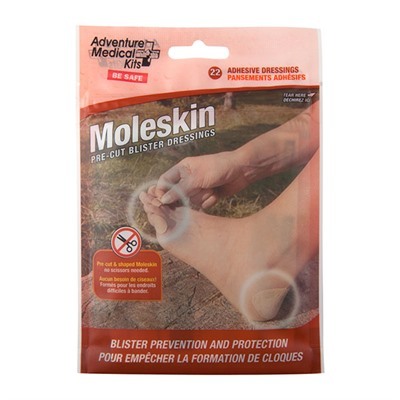 Moleskin is the most reliable dressing for blister prevention available. Adventure Medical Kits has made it easier than ever to apply, adding die-cut shapes to fit common problem areas, including the heel, side of foot, and toes. Apply moleskin to problem areas before you begin hiking or as soon as you feel friction on the trail, and blisters will be a thing of the past. Includes alcohol wipes for surface preparation. Mfg: Adventure Medical Kits SPECS: Size: 4.25" x 6.5" x .5", Weight: 1.6 oz.